The clinical research for rheumatoid arthritis includes 13 double-blind, placebo-controlled studies1 showing results such as an improvement in patient’s overall assessment of pain, a reduction in tender joint count, a reduction in morning stiffness, and so on. 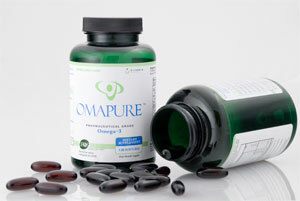 OMAPURE™’s formulation closely mirrors a randomized double-blind placebo controlled study published in the highly regarded peer reviewed medical journal, Arthritis & Rheumatism.5 OMAPURE™ contains the same amount of EPA (the main anti-inflammatory ingredient in Omega-3) used in this very successful clinical trial. A negative % change from baseline means that the patient reported a drop in severity of disease activity. 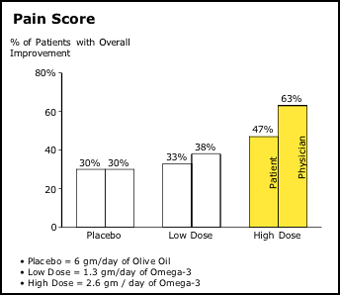 The high dose (as found in OMAPURE™) demonstrated superior effect compared to the low dose (as found in most Omega-3 brands) and placebo. 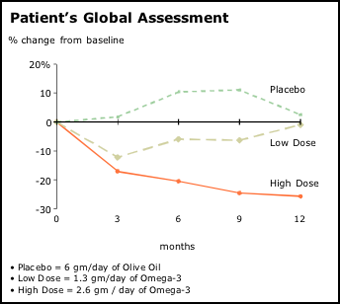 Also noteworthy is that patients who stuck with the high dose Omega-3 therapy for 12 months were able to realize an additional 50% improvement above and beyond the superior results they already obtained by the third month. NSAIDs side effects can be severe and include morbidity and mortality. It is no small feat that about half of the patients were able to reduce their use of NSAIDs and DMARDs by using a natural supplement. The results from this particular clinical trial are not atypical. 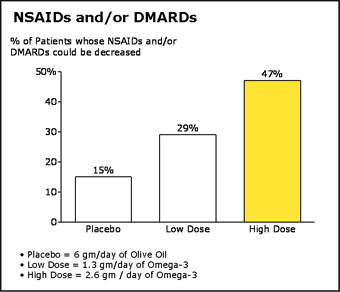 Please read about several other clinical studies demonstrating high dose Omega-3’s ability to reduce or eliminate NSAID use. OMAPURE™’s formulation of 1.7 grams of EPA and 2.6 grams of Omega-3 closely mirrors the same treatment given the patients in the above double-blind placebo controlled trial. As highlighted above, these patients showed a noticeable improvement in overall global assessment, a reduction in pain, and the potential to decrease dangerous NSAID use – all without significant side effects.